The trade saga between the Cavaliers and Celtics has become more and more cloudy and complex as the clock is ticking for them to finalize the mega blockbuster deal that is set to send Kyrie Irving to the Celtics in exchange for Isaiah Thomas, Jae Crowder, Ante Zizic and Brooklyn’s Unprotected 2018 1st Round Pick. Because of complications and the reported severity of Thomas’s hip injury, the Cavaliers are delaying the finalization of the blockbuster deal and threatening to void the trade with the Celtics if they don’t sweeten the pot with the addition of Jayson Tatum or Jaylen Brown to compensate for acquiring an injured player in Thomas. Story posting soon on ESPN: After Thomas physical, Cavs planning to seek further compensation before finalizing Irving trade to Boston. Thomas apparently does not require surgery on the hip, just rest and rehab time, something the Cavaliers are not too happy about considering they are attempting to compete for another title in what could be LeBron James’s final year with the team. The deadline for the deal to be finalized with the league office is Wednesday evening, unless the teams agree to delay the deadline which seems likely at the moment. To me you can pretty easily simplify this whole situation. If Thomas is hurt badly enough that he will miss considerable time next season and there is a chance he won’t be fully healthy or have his full flexibility or quickness the entire season if he does play then the Cavs need to void the deal and move on. If the injury is minor and he should be back at full health and ability by training camp or the first month of the season, the Celtics should take a hard stance and say take it or leave it with the offer that was agreed to last week. 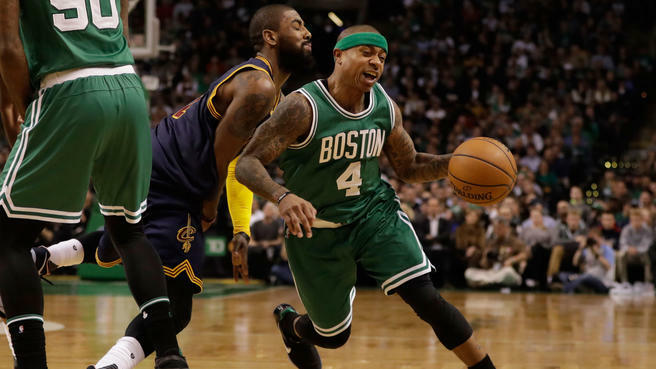 The Cavs shouldn’t acquire a seriously injured centerpiece in a deal for a 25-year-old superstar and the Celtics shouldn’t cave and give up even more assets if Thomas’s injury is relatively minor. Let’s see who wins this staring contest or if a deal ultimately falls through, I think it gets done as is.